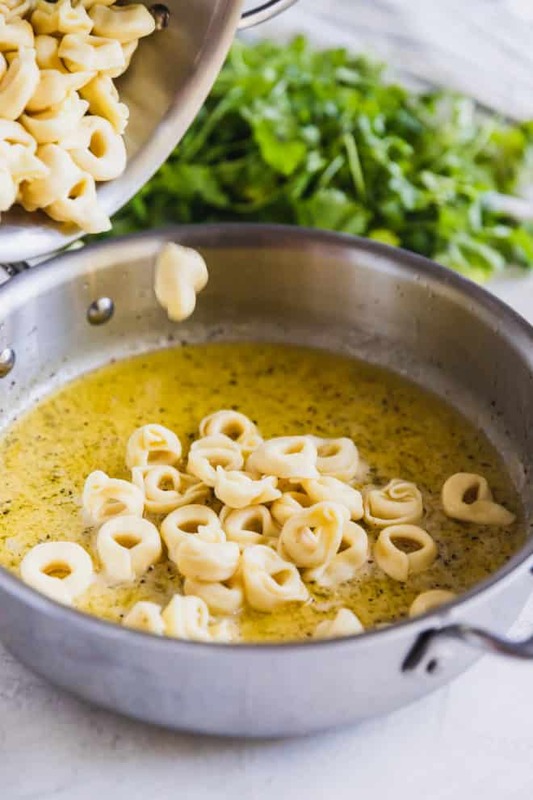 An easy, delicious recipe for Cheese Tortellini in garlic butter sauce. 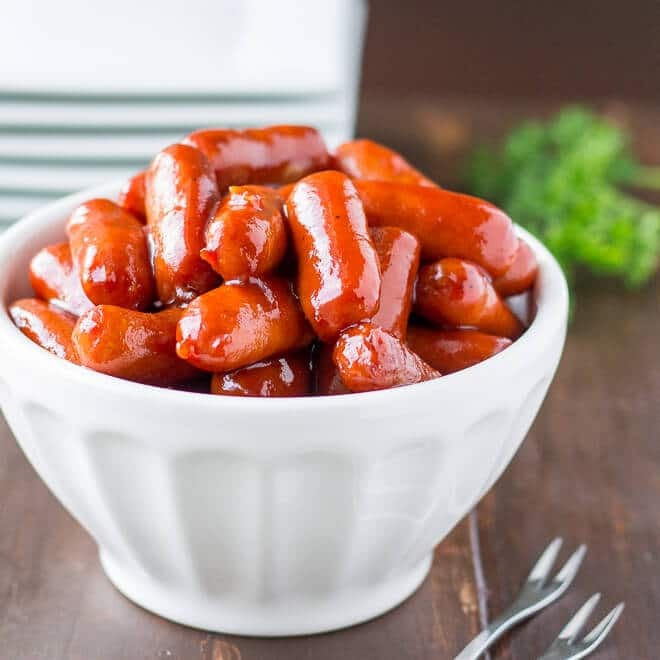 Whether you want a hot appetizer for a party or a tasty, comforting weeknight meal option, double the batch because everyone is going to love it! Use refrigerated or frozen cheese tortellini; either way, it’s ready in 15 minutes or less! How do you cook cheese tortellini? Bring 4 quarts of water or broth to a boil for each pound of tortellini. Add salt if desired; I like 1 tablespoon salt if I’m using water. I do not add salt if I’m using broth. Gently drain and follow remaining recipe instructions (or serve). Although I typically purchase low-sodium chicken broth and unsalted butter, this particular recipe tasted a little off when I tested with those ingredients. So, in this one instance I do not recommend the low-sodium options. If that’s what you have, just add a little salt to the finished dish until it tastes perfect. What is the difference between a tortellini and a tortelloni? Tortellini and tortelloni have the same basic shape. However, tortellini are smaller (generally about 2 grams each by weight) and tortelloni are larger (generally about 5 grams each by weight). Both tortellini and tortelloni are commonly filled with cheese or vegetable fillings. Tortellini could also be filled with a meat mixture, but tortelloni are less likely to have a meat filling. Tortellini, because of their small size, could easily be served in a soup or other broth-based dish. Tortelloni, however, are typically served only in a sauce. Can you cook tortellini from frozen? Yes, just bring 4 quarts of water and 1 tablespoon salt to boil for each pound of tortellini. Add the tortellini (unthawed) and cook until they float to the top, usually in about 3 to 5 minutes. The internal temperature of a tortellini should reach 165 degrees in the coldest spot. What is the main difference between ravioli and tortellini? Ravioli can be square or circular, but they are formed by pressing two pieces of dough together around a filling. 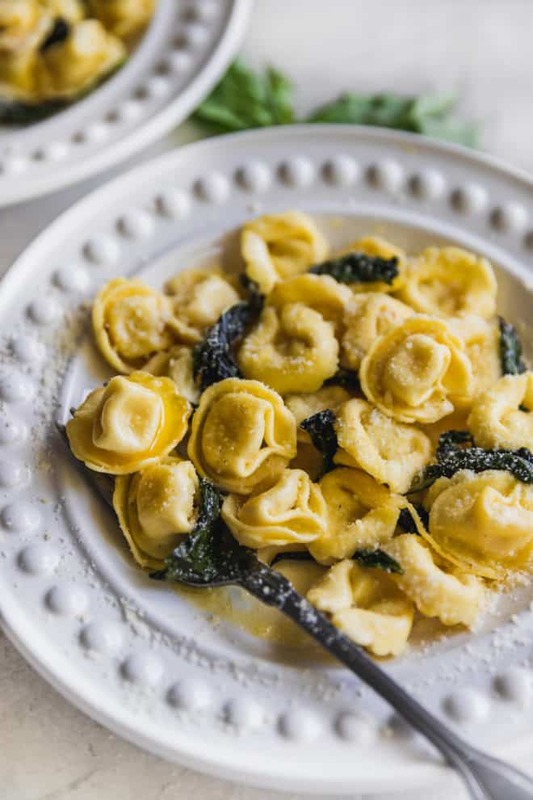 Tortellini are more like a dumpling where the dough is formed into a hat-like shape. How long can you keep cooked cheese tortellini? An easy, delicious recipe for Cheese Tortellini in garlic butter sauce. 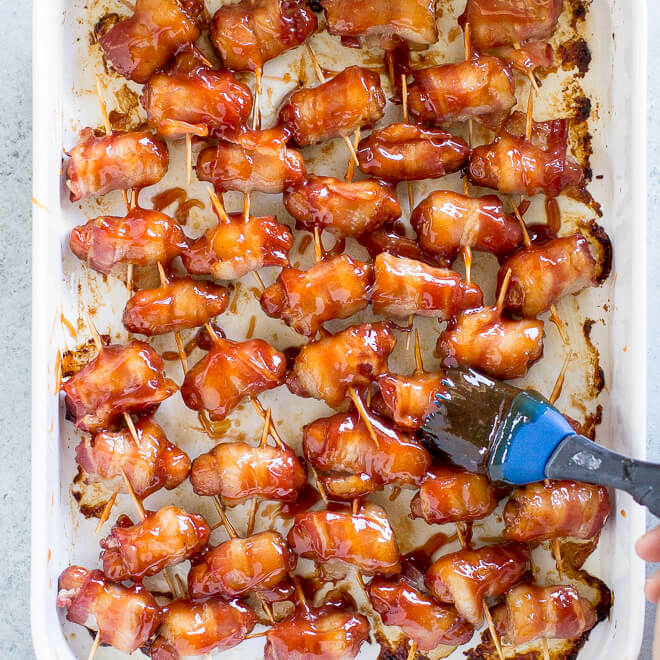 Whether you want a hot appetizer for a party or a tasty, comforting weeknight meal option, double the batch because everyone is going to love it! Use refrigerated or frozen cheese tortellini; either way, it's ready in 15 minutes or less! In a large pot, bring 2 1/2 cups broth to a boil. Add cheese tortellini. Return to a boil and cook until the tortellini float to the top of the water, about 3 minutes. The internal temperature of a tortellini should be 165ºF. Drain completely. Meanwhile, whisk together remaining 1 1/2 cups broth with corn starch. In a large non-stick skillet, melt butter over medium-high heat until foaming. Stir in garlic and basil and cook 2 minutes. Add broth-cornstarch mixture and bring to a boil; simmer until the mixture thickens, about 2 minutes longer. Add the cooked tortellini to the skillet and toss to coat. Pour into a serving dish and garnish with Parmesan cheese and parsley, if desired. To make this dish vegetarian, substitute vegetable broth for the chicken broth. Refrigerated tortellini can be substituted; it will float in 2 to 3 minutes. If you want to use dried tortellini, follow the instructions on the package (should be about 10 to 11 minutes). 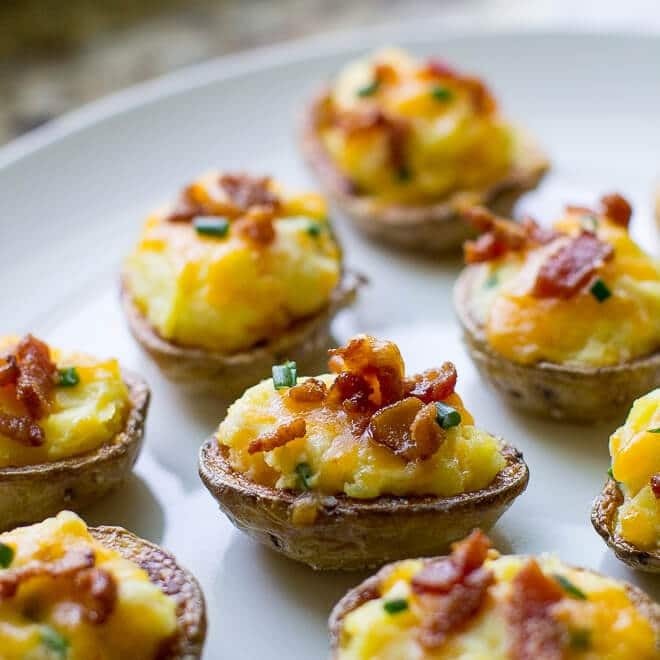 Serves 8 as an appetizer or first course (2 ounces per person, 275 calories per serving). Keep warm in a slow cooker if serving a buffet. 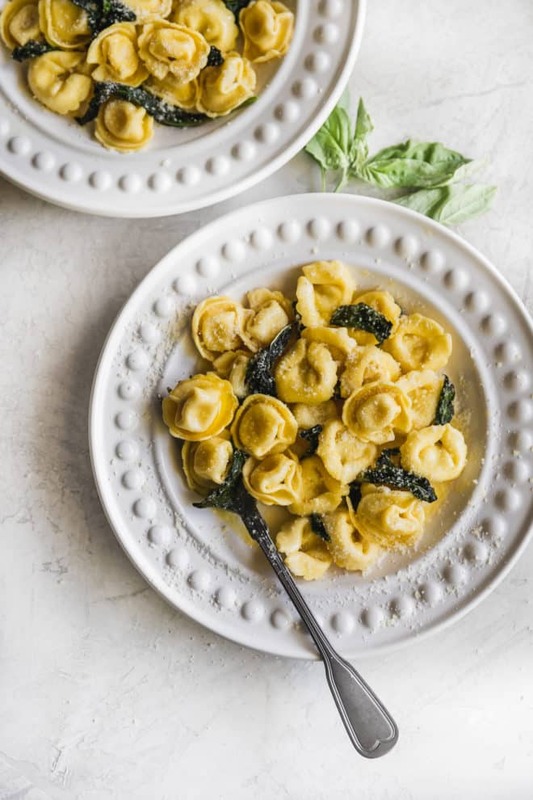 I always have tortellini in the freezer because they make the perfect quick meal on those days when I just can’t go to the store and I need my ’emergency food dinner’. This dish would make a perfect emergency food dinner because you can keep all the ingredients in the freezer, pantry and fridge at all times. Thank you so much, Christin! I could eat the entire batch of tortellini myself, I swear. I’m obsessed. Have a great weekend! Great recipe but since I only had a 12 oz pkg of dried tortellini that’s what I used. However 2-1/2 cups of broth isn’t near enough liquid to cook the pasta. I had to add another 2 cups. Hi Pat! Sorry about that, I have always used 2 1/2 cups of broth to cook this, but I’ll retest. I know I never used the same ratio as I would for cooking regular pasta because the tortellini only takes a couple of minutes to float. But, I’ll take a look! Sorry again, and thanks. I would recommend using a chicken bouillon cube in enough boiling water. That way you can fill your bot with enough liquid to ensure a good cook. Then you only need a small can of broth or stock to make the sauce with. That’s a great tip, Jerry! Good cost savings. Thanks. If you try the tortellini, I hope you love it! Can always add a little water. This was delicious!! To save time during clean-up, I cooked and drained the tortellini, and then used the same pot to make the sauce. It came out great! Hi Deborah, that is a great idea (using just one pot). I will update the recipe to reflect your genius! Thank you so much. :D Most importantly, glad you liked it! I was wondering about the chicken stock you make the totellini in. Instead of draining the stock couldnt you remove the tortellini out and use the stock for the garlic sauce? I love this recipe. 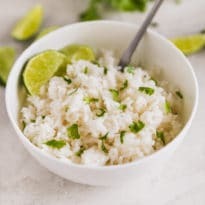 It is quick, easy, and tasty. I think it comes out perfect each time. 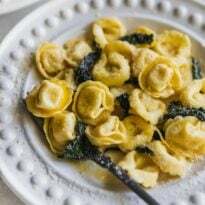 I have tried making this recipe with a combination of different filled tortellini. I have used cheese and Italian sausage and I have just made half cheese tortellini and half beef tortellini. Thank you so much Danielle! This is one of my favorites. It always tastes so good, I cannot stop eating. I will definitely have to try meat-filled ravioli sometime, I’ve only ever done the cheese. But sausage in particular sounds awesome. :) Thanks again! Hi Meghan! I just tried this recipe and wow! I just wouldn’t have thought to cook the torts in chicken broth! And I do think of things like! I used fresh basil cause that’s what I had then saw the chopped tomato basil olive oil veg from last night so I added them to the garlic butter basil sauce, chopping the tomatoes very small then added the sauce to the torts in broth pan and super wow! You are so right about the flavors! Thank you so much for the recipe! Hi Rosalie! The chopped tomatoes sound AMAZING! I’m so glad you tried the recipe and loved it. :) Makes my heart sing! Take care and thanks so much! How long did it take for sauce to thicken? I’m wondering if I have the right consistency. Hi Jenna, it should thicken in 1-2 minutes. If it’s not thickening up, your pan might need to be hotter. I hope this helps! I hope it works for you! Thanks for your question. Ok hmmm I think I put too much chicken broth in then. Thank you! I love this dish and will be making it for a party this weekend. I was curious on your suggestion for travel. The party is 45 min from where I live and I don’t know if I should cook the sauce and tortellini and mix at the party or just reheat the dish when we arrive? I want the guests to get the best experience with this dish! Hi Lindsey! I haven’t tried this so I can say for sure, but my guess would be that you could just mix it all together and reheat the dish when you arrive. I’m not sure there is much difference between keeping the sauce separate vs. mixing it all up. I would love to hear how it turns out for you though! Thanks for your question. This recipe sounds amazing! Going to try it tonight. But on a side note, to make it vegetarian the Parmesan cheese needs to be omitted too. Hi Jordan, I know lots of vegetarians that eat cheese. Any special reason Parmesan would pose a problem? Thanks for your help! I appreciate you! Hi Jordan! My assistant Jana (a vegetarian) informed me that the calf rennet is the problem with the Parmesan. I didn’t realize although I should have because I know how cheese is made! She suggested substituting a vegetarian Italian hard cheese from someplace like Whole Foods. Sorry about that and thank you for your help! I’m excited to try this! Do you think it would be meal prep friendl? Maybe freezer stash or even in the fridge on Sunday afternoon for Monday night? Hi, Lauren! Thanks for your question. I *think* it would be meal-prep friendly, especially just 1 day in advance. It’s basically just pasta so that always reheats nicely. I will definitely have to try that out myself so I can update the post! Great question. I definitely think it’s worth a try and should work just fine. Thank you! I was hoping for a better outcome. I don’t know what I did, but the sauce came out horrible. I used chicken bullion and the sauce came out brown and almost had a gelatinous consistency. I can’t compare the taste to anything I’ve ever had. It was atrocious. I’m going to try heavy cream next time. I’m sure it was just something I did. To many great reviews for it to be the recipe! Hi Elizabeth, I am so sorry to hear that!!! I have only ever used broth from a box, so I don’t know if the buillion had something to do with it. The sauce does get thick, don’t know if I’d say gelatinous but obviously there is cornstarch so it thickens up enough to coat the tortellini. Did you happen to watch my video to see if the process went more or less the same for you? So sorry it didn’t turn out. Hi Meggan! The s was an awesome recipe!! It got thumbs up from all three kids (1y, 6y, and 8y)!! They were begging for more! Unfortunately this recipe was a last second find and I didn’t have chicken broth on hand but I used a couple of bouillon cubes and it turned out great! It was brown but only because I ‘melted’ the butter a little too long! It still tasted wonderful!! Thanks again!! Can you use the dry cheese tortellini? Hi Jennifer, 100% yes! Just following the cooking instructions for that on the package. It should be about the same, I think. Whatever it says, it will work just fine. Thank you for the question! Really good recipe! I sauteed asparagus in the butter and added bacon too! Meggan. Made this for my 10 year old and he liked it, but mine, too, turned an almost unappetizing brown color and quite thick. I would like to make it again for him, but this time I would like to watch your tutorial… I just can’t find it. Your post says to “scroll down”,and I have… it’s probably a case of I’m looking too hard and it’s right under my nose. Can you send me a link to the video? I would really like to see what I’m doing wrong so my dish looks as delicious as yours. Thank you so much. Sorry for the trouble and confusion, I hope this helps! Take care and please let me know if you need anything else. hi, i was just wondering if you could use frozen cheese tortellini and if it would effect the cook time or if i should use water or broth. Hi Anna, I’ve definitely used frozen cheese tortellini for this recipe. You may have to add a couple more minutes to the cook time, but not a lot. Just take a look at the package and see how long they say to cook it for, and that’s probably about the right time. I’m guessing it’s 5 minutes or less. You can use either water or broth, that won’t affect that cooking time. If you need anything else or have other questions, please just let me know! Thanks. Quote from the 11 year old: “I must say, whatever this sauce is, it is AMAZZZZZING. It even makes this cheese tortellini taste good.” (He had just informed me while cooking the tortellini that he wasn’t particularly fond of the brand I had chosen). This is a kid who is a pretty adventurous eater but does not like red sauces and is sick of alfredo sauce. So we rarely do pasta. Thanks for the easy, yummy recipe. He even wanted to have the leftovers saved to eat before going to his sport practice. (a rare compliment!) We used veggie broth for ours version. I was wondering if using flour instead of cornstarch would work? I’m out of cornstarch and debating on going to the store to get some. I can’t think of a reason why flour wouldn’t work. However, if you are the sort of person who gets super upset about recipes gone wrong and/or food waste, please don’t let me accidentally ruin your day!!! LOL! But butter + flour works for sauces everywhere. I will test it at some point so I can definitively answer your question. Thanks for the fast reply! No I don’t get upset lol it happens often. I may also try powdered garlic. 🤞🏻Thanks again! I wish I could post the photos of how it turned out! It was perfect. Perfect color and consistency. I chose to change up the steps and make the sauce like I would gravy since I was using flour. I’ just added the flour to the simmering butter mix and then whisked thebroth in. I think for those who say the broth isn’t enough to boil the tortellini need to boil it with a lid on so the broth doesn’t evaporate and boil at a lower temp. I used 19 oz instead of 16 oz of tortellini and I added shrimp so I needed to make sure I had a little more sauce. I had more than enough broth left over plus the cup and a half I set aside. I just removed the tortellini and put it in a covered bowl to keep warm. Then I combined the remaining broth with the broth I set aside. Next time I won’t sit any broth aside and just Strain the broth into a bowl after I use it to boil the tortellini. Anyways I added the shrimp and some cherry tomatoes I cut in half a little after I added the broth. I whisked it slightly until it started to lightly simmer. It started to thicken pretty fast. When I thought the sauce was thick enough I added the tortellini to the pot and mixed it up. Then I dumped it all into a bowl to let stand. I used a cast Iron pot. Before I started cooking I unthawed precooked shrimp. I put the shrimp in a bowl and added melted butter, a splash of lemon juice, garlic powder, parsley, pepper and a little salt. I mixed that all up and set it aside to marinate a bit. When I added the shrimp I drained the marinade I made away. I think I marinated the shrimp for about an hour. I was moving pretty slow. Lol I went to the winery yesterday so it took me about an hour total to get everything out and actually start cooking. I made red lobster cheddar bay biscuits from a box kit to go with it. Thanks for this recipe. Everyone loved it! I made this tonight and it was a big hit. At step 2 I added 1/2 cup of chopped onion with fresh basil and garlic which I think gave it a lot of flavor. Super easy and would make it again. 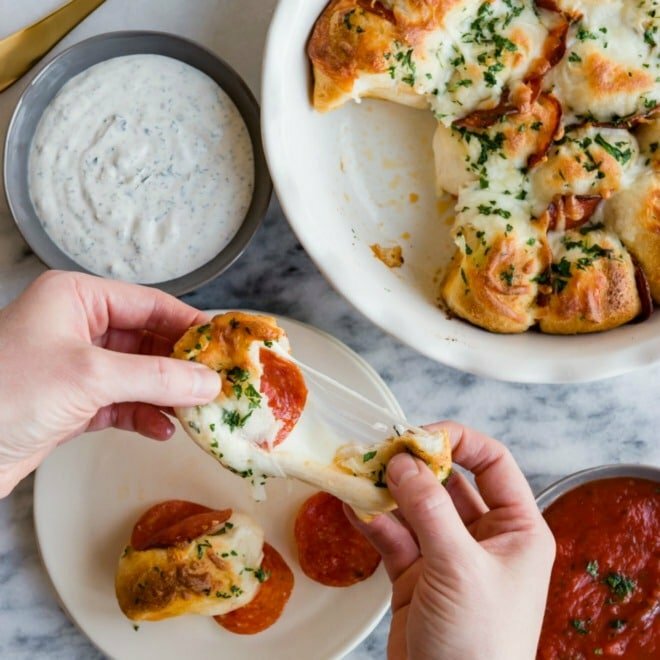 I’ve missed this in the past, but will definitely be making this for my tortellini obsessed kids. I think tortellini was their first word. Delicious recipe. I used fresh tortellini. Butter, garlic and basil… what a perfect sauce for them. I am a big fan of Italian cuisine but my husband prefers the French. This is the perfect compromise, replacing the olive oil with butter. :) Thank you for the recipe.